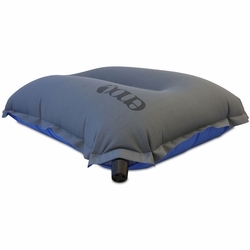 ENO HeadTrip Inflatable Pillow. Complementing the AirLoft, the HeadTrip - made from upcycled foam - is a foam/air hybrid featuring brushed fabric for hotel style comfort. Self-inflating and only 8oz, the HeadTrip fits neatly into its included stuff sack for any outdoors adventure. Eagles Nest Outfitters. Dimensions	(L x W) 15" x 2-4.5"